After a crazy rise in December, January was a very bad month for crypto-currencies. The most famous one, Bitcoin, lost about two third of its value. As a result, my ICO portfolio also suffered. I’m really happy I invested only a small sum as I’m not sure I could bear such volatility ! Currently only two tokens are valued. C20 value is available in realtime at the project’s homepage, while pas values are displayed in the performance page. In addition to this, C20 is finally trading on exchanges. I’m using the official NAV value here, as there are differences between exchanges prices; moreover, the small liquidity may lead to unrealistic prices.At the end of January, C20 token’s value was around $2.31 (versus $2.91 last month). 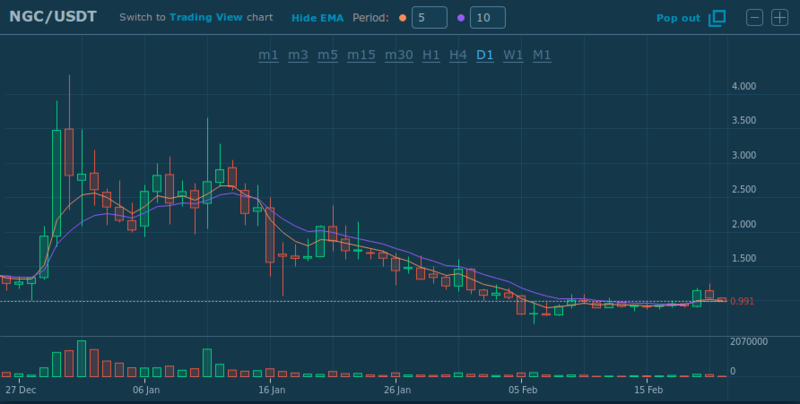 Here’s NGC priced in USD at HitBTC; the chart includes most of February as I’m writing this article very late 🙁 While the token was worth at $2.82 at the end of December, it dropped to $1.46 at the end of January. My ICOs portfolio saw an insane growth in December. In January, it went back to Earth – especially NGC -. The total growth of the portfolio is now “only” 25%. This figure shows how crazy the crypto-currencies world is; it’s a huge drop compared to last month (where I doubled my portfolio), but even after that, the return is still impressive for such a small time. Spoiler alert 🙂 After missing the WePower ICO, I decided to invest in NapoleonX, a crypto asset manager. I’ve been considering it for some time, and finally invested in it. I’ll provide more details in next month’s ICo review. Also, as I really appreciate Crypto20’s approach, I keep a close eye on their current developments, and will probably invest in their future tokens.